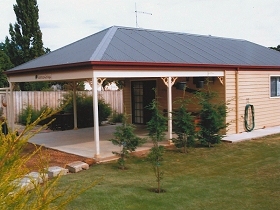 Man-O-Ross Hotel provides hotel and self-contained accommodation in the historic town of Ross, Tasmania. The hotel, built in 1825, offers five rooms. There is a family room with a double bed and two single beds, two double rooms, a twin room and another with a queen-size bed. The self-contained cottage has a queen-size bed and full bathroom and laundry facilities. In your historic accommodation, feel the tranquillity that has accumulated over the years. Soft colours, sash windows and colonial decor take you back in time. Careful refurbishment provided modern conveniences and preserves the traditional elegance. 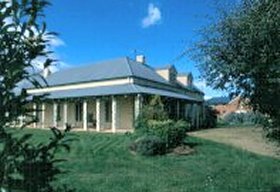 At the end of busy days sightseeing up and down the Heritage Highway (a historical treasure hunt) the sight of the Man-o-Ross timbered gables, flowery garden and mellow sandstone will be a welcome sight. 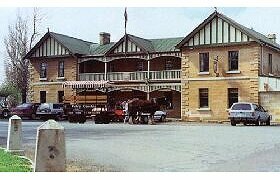 Imagine a pioneering settlement, a garrison where red-coated soldiers strutted the streets and sad convicts shuffled in irons. Imagine it now – Georgian sandstone cottages as charming as ever, but the people in the streets strolling, not marching, and likely to be carrying fishing rods – not a swagger stick in sight. 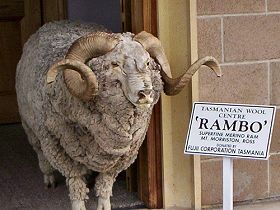 Ross is about an hours’ drive from Launceston (78 kilometres/48 miles) south along the Heritage Highway.